There are some things in this world that are always constant, change will always happen and time will go on! 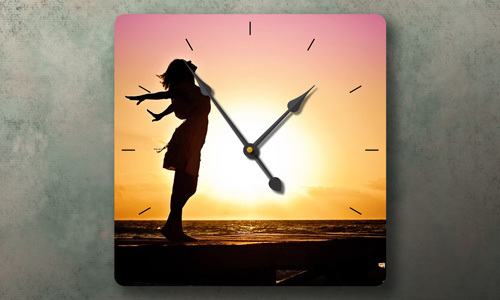 Why not keep track of that time with a custom printed wall clock with your favorite photo or graphics. We offer both a round and square clock for you to choose from. 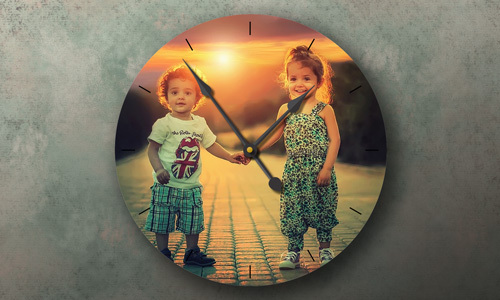 If you want to give a truly unique gift we offer clocks with an aerial photo of almost any location (we are licensed to use Bing areial photos). Round, Square or Rte 66! We now have multiple sizes and shapes for our clocks. 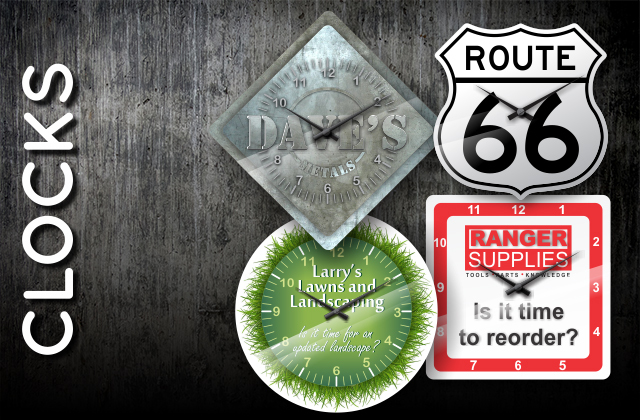 We now have Round, Square and our new Rte 66 shaped metal so you can create your own piece of history! Our round clocks are 11.75 inches and have all of the mounting and clock movements ready to go. These are great to display round graphics or images. Our square clocks can be used either in a square or diamond layout (rotated 45°) to give 2 different looks. These square clocks are 12 inches on each side giving a large art canvas. 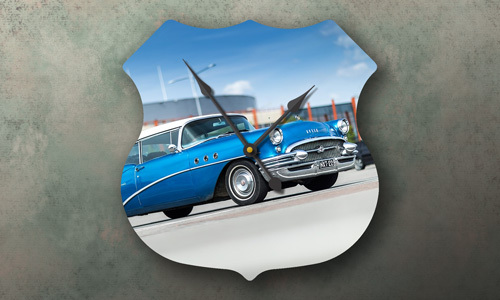 Our Route 66 clocks have the shape of the highway signs and are 11.25 inches at the widest point. Please note that 1 AA batter will be required ( as it is not supplied with the clock ) and the clock hand styles may/will vary. 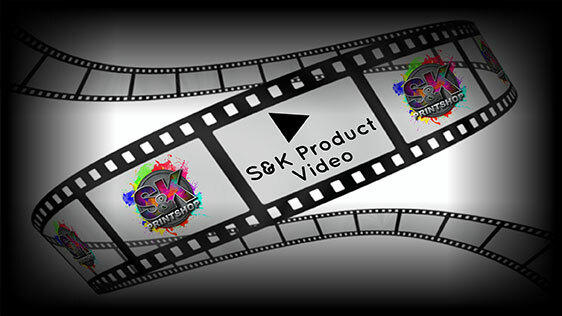 Click Here to get a FREE quote from S&K for next Clocks printing job! The clock faces are made of aluminum that have the center hole punched, ready for the clock movements to be installed. You can press the square clock face in multiple angles, giving you many choices! The movement requires one (1) AA Battery, which is not supplied with the clock kit. All of our products come with a possible 10% quantity +/- increase/decrease total. These will be mostly seen with larger quantity items such as our stickers/decals, dye sub transfer sheets, mousepads, etc where there are high quantities with the same artwork on each item. The customer will be responsible for any charges for these overages at the same rate per item along with rest of the quoted order. You can press both of our clock faces on a 16x20 Inch press. If you will be pressing the clock you will receive the clock face ( aluminum ) and the clock movement ( gear and hands ) and after you press you will then do a quick assembly of the movement gear through the pre-drilled hole in the aluminum.